"Three hundred and two blocks east of downtown Portland, on Lusted Road, a farmer’s field was turned into a real field of dreams in September of 1968. At that time, 550 people from the communities of Hillsview, Pleasant Home, Powell Valley, Orient, Boring, Damascus and Gresham, and other places as well, formed the student body of the newest high school in the Gresham Union High School district. The dreams of thousand have filled the rooms and halls of what we proudly know as Sam Barlow High School…home of the Bruins. Sam Barlow High School was named after the pioneer Samuel Kimbrough Barlow who, in 1845, decided to search for a better life. Barlow believed that better life could be found at the end of the Oregon Trail. Because of the tremendous cost of sending his belongings down the Columbia River to the Willamette River at Oregon City on a barge, he looked for other options. He searched for an overland passageway around Mt. Hood to Oregon City, a route now known as the Barlow Road. His group arrived in Oregon City on Christmas Eve in 1845. He then settled in Oregon City and concentrated on upgrading the road so more pioneers could use it as a way to get to the Willamette Valley. Edith Green, member of the U.S. House of Representatives from Oregon’s Third Congressional District, was the guest speaker at the dedication of Sam Barlow High School on November 6, 1968, in the gymnasium. James Carson, head of the school board, presented the school to Dr. Alan Thede, principal, who, with student body president Bob Deatherage, accepted on behalf of the students and the community. Scholastic excellence and student achievement have been the pursuit of Sam Barlow High School throughout its existence. A rigorous academic program taught by outstanding faculty has challenged the most dedicate learners. The program offerings are varied and flexible, with a multitude of co-curricular activities that complement the instructional programs. These diverse activities have enabled students to become involved, broadened their horizons in myriad ways, and enriched their lives." The time that I spent in the classroom at Sam Barlow High School allowed me to realize what it takes to be a good teacher. It also provided me with a better understanding of what obstacles I'm up against in my future as an educator. The most important and somewhat obvious lesson that I'm taking away from this whole experience is, every student excels in different learning environments. My ultimate goal as a math teacher is to move away from the stereotypical math classroom environment and move toward a more innovative and participatory environment, such as an inquiry based classroom. However, after working with students with different preferred learning styles and different personalities, I've come to realize that this teaching method could potentially inhibit some of the students' learning, particularly the students who are shy or have trouble working in small groups. It's going to be a challenge for me to learn how to best accommodate every student's learning style, but I'm looking forward to learning what method of teaching promotes the best learning environment and supplies students with the best understanding. Sam Barlow is currently home to 1,644 students. Of those 1,644 students, at least 38% of the student body is eligible for free and reduced lunch. This number has continued to increase over the last five years, as well as the class sizes, which have increased from 26 students in 2008 to almost 32 in 2014. Even though Sam Barlow is experiencing a drop in socioeconomic status and a rise in class sizes, Sam Barlow holds a high value in all of their students' achievements. Sam Barlow has a graduation rate of 85%, which is 17% higher than the state average. 67% of graduating students enroll in higher education within 16 months of graduation, which is 12% higher than state average. 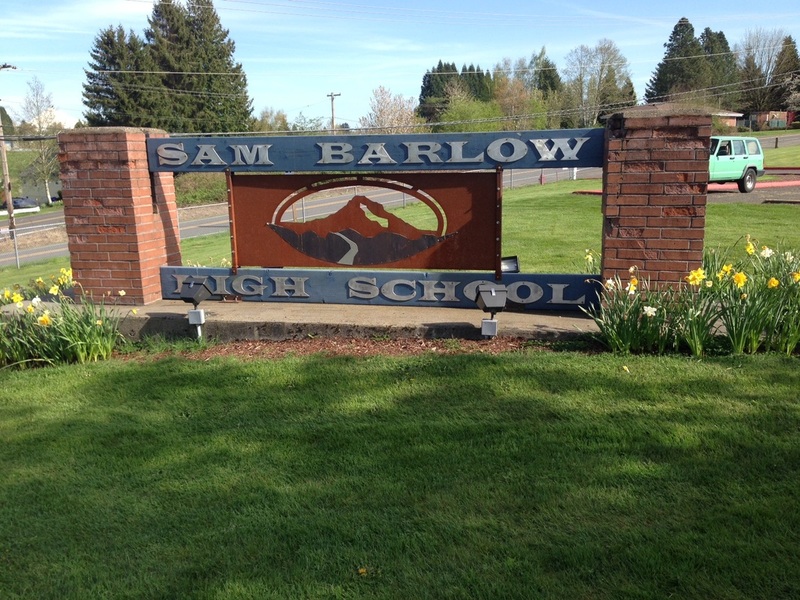 Sam Barlow is also home of one of the highest number of national board certified teachers in the state of Oregon. Originally when I began this project, I was hoping that I would have the opportunity of being a math tutor at Sam Barlow High School. However, due to changes with class schedules at Sam Barlow, my community partner and I decided it would be best if I volunteered in as many math classes as possible. My responsibilities consist of observing students in the classroom and observing different teaching styles (which I will address in the following section), as well as grading homework, quizzes and making sure that students are understanding the new material that they are presented with in class. I'm very grateful for the opportunity that I was given at Sam Barlow. My community partner recommended me to volunteer and observe as many different math classes as I possibly could. This allowed me to work with students of all ages and capabilities. My community partner thought by me experiencing different classroom environments it would help me understand the environment and teaching style I wish to uphold in my future classroom. After working these past nine weeks and observing different teaching styles and students participation to different teaching styles, I feel very confident in the manner I wish to teach my class. Let me just first start by saying that every teacher I worked with at Sam Barlow was an excellent educator. However, I picture my classroom environment much differently than theirs. Based on my work in the classrooms, the main similarity between each classroom environment is that they were taught in almost identical fashions. It's how math has been taught forever. In a 50 minute class, the first 10-15 minutes is spent reviewing homework problems, followed by a 20 minute lecture over new material, and ending class with about 15 minutes to work on homework. This is all well and great, however, I feel that this particular teaching method is not the ideal way to have students actively participate and understand the mathematics that they are learning. This is why I think inquiry based learning environments is the future classroom environment for teaching students math. My future plan of action for when I become a teacher is to implement an inquiry based learning environment and promote my students to have learning based goals instead of performance based goals. What is inquiry based learning? Inquiry based learning is a process where students are divided up into groups of four or five students, where students formulate questions, investigate to find answers and build and create new understanding, meaning and knowledge, and then each group communicates their findings to the other groups of students in the class. By establishing this type of classroom environment, we are not only promoting our students to actively participate, we are also promoting them to be critical thinkers. Inquiry based learning requires students to explore a specific topic and develop their understanding, instead of just giving them a list of formulas and definitions to memorize. By promoting this style of teaching within my classroom, I also hope to promote learning based goals instead of performance based goals. Performance goals are goals that are focused on gaining favorable judgements or avoiding unfavorable judgements, whereas, learning goals are focused on behaviors, knowledge and understanding that students identify as important to their own learning. The main difference between these goals to me is mistakes. I want my students to understand that mistakes do not imply that they are bad at math. Mistakes are at the foreground of learning any new type of mathematics. Overall, I want my students to understand that learning math, or any subject for that matter, requires mistakes, attitude, time and hanging in there. By students realizing their mistakes, keeping a positive attitude, putting in the time needed, hanging in there, and not giving up, I have no doubt that all students can be great at math or any subject that they put their minds to.